How does a “Typical” Adoption Go? We recognize that you have choices when faced with an unwanted pregnancy. We want to make sure that you explore all options and make the choice that is right for you. Pregnancy does not always come at a time when people are prepared for it. Some mothers-to-be may not have a supportive partner. Some parents-to-be aren’t financially able to support a new baby, or may not have attained educational, career or personal goals. Unexpected parenthood can be a frightening, isolating and a stress-filled experience. In choosing adoption, you will be assigned an adoption caseworker who will see you through every step of the adoption process. She recognizes that this is a most difficult time in your life. She will be available to you 7 days a week. For some girls abortion is not an option due to personal values. Many girls recognize the long-term emotional ramifications of abortion...many of which resurface years after the abortion. Very special women choose adoption, they choose to give to others the ultimate and most selfless gift of all- the gift of love. Women choosing adoption give adopting parents an opportunity (one they otherwise might never have) to provide for, nurture and love a child. Perhaps more importantly, birth mothers give their child a chance for a richer, fuller, happier future than they are able to provide at this particular point in their life. Only the most self-less, courageous women think of the well-being of their child and choose to give them the best life possible. An adoption may be as open or as private as the birth mother chooses. In an “Open Adoption” the birth mother chooses the couple and speak or meet with the prospective adopting parents. The birth mother can keep in touch with the child until adulthood through cards, pictures, updates, phone calls and in some cases, visits. Private independent adoptions allow the birth mother, if she wishes, to specify characteristics she desires- for example: religion, race, educational background, lifestyle and geographics- in the adoptive couple. It is the birth mother who makes the final decision as to placement. Other women choose to keep every aspect of the adoption private. This is called a “Closed Adoption”. A closed adoption is where a birth mother chooses to place her child for adoption and leaves it up to our law firm to place the child with a suitable family based on the criteria she stated in her interview. Birth mothers opting for a closed adoption normally do not interact with the child or have on-going contact as the child grows up. All names of the birth mother and the adopting couple are kept confidential. Every adoption is as unique as the individuals involved in it. These are the two examples of adoption choices. A woman can pick and choose what aspects of each are most comfortable for her. What is right for you may not be right for another. We respect your right to choose what is right for you. At this most difficult time birth mothers may be facing a financial crisis on top of the emotional aspect of facing an unwanted pregnancy. This is an important time in a girl’s life to feel safe and secure. Free counseling is available by a licensed social worker. Our adoption caseworker will assist the birth mother in finding appropriate housing and obtaining prenatal medical care. 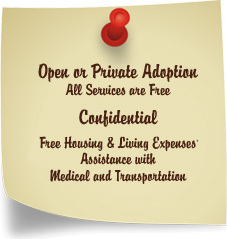 Housing costs such as rent and utilities can be provided free of charge. Living expenses such as food and transportation are also covered costs. Meet with our caseworker at your convenience (we come to you or you may come to our office) or have the paperwork confidentially mailed to you. Based on your preferences stated in the paperwork, we match you with prospective adopting parents that meet your criteria. If you wish to choose the adopting parents for your child you will be presented with photo albums or “profiles” of these families. You may wish to engage in a phone interview and/ or meet in person. Free counseling will provided if requested. Your financial, housing, medical and living expenses will be addressed continuously throughout the pregnancy and up until a period of time after you deliver. Your adoption caseworker will work with you on an “adoption plan” for when you go into labor. You have choices at most hospitals; you can have the child in the room with you, in the nursery, or in a separate room with the adopting couple. You may also wish to stay on the maternity floor or prefer to be moved to the surgical floor after delivery so that you are not around other infants. The caseworker handles all the hospital arrangements based on your adoption plan with the hospital staff (so that you don’t have to). Your baby normally is discharged from the hospital directly to your chosen adoptive couple. On occasion transitional care is needed if unforeseen circumstances occur. We have wonderful families who are licensed to “babysit” until the adopting couple arrives. About 24- 48 hours after you are discharged from the hospital you would meet with your counselor. After counseling you would meet with the attorney to sign parental relinquishments. Continue contact with your adopting couple (if you requested this) until the child reaches 18 years of age. All adoptive parents must go through extensive background checks and be approved to adopt. Adoptive parents are required to provide a State Bureau of Investigation report as well as a child abuse clearance report. They provide birth certificates, marriage licenses, physician reports and letters of reference. All couples are interviewed several times in their home by a licensed social worker. The approval process for a couple waiting to adopt is approximately six months. For many girls the facts surrounding the birth father are unknown. For others, the birth father is not in agreement with the adoption plan. Other birth fathers are supportive of the birth mother and her decision to place the child for adoption. We are required by law to make every effort to locate the birth father with what information we do have and gain his consent, or terminate his parental rights. Frequently we serve a birth father with notice. The burden is then placed on him to file the necessary paperwork with the court to contest the adoption. We do not contact him again. In all cases, during this process, you can continue to move forward with the adoption.